Does The Gtech eScent Mountain eBike Offer A Better Ride? There are lots of companies out to create the perfect marriage of e-bike and mountain bike, but the Gtech eScent Mountain eBike might actually have the balance right. The sales photos and basic specs provide a great first impression of this ride. It doesn’t seem to be all about the battery or motor, but there seems to be enough detail to the electronic system to offer plenty of help. Are riders impressed with what they receive? The Pros and Cons of this Gtech eScent Mountain Electric Bike. some fiddly aspects to the assembly process. The look and feel of this Gtech eScent Mountain eBike makes it a great mountain bike, and the battery is a nice bonus. When buyers read the specification for this bike, it is easy to forget for a moment that it is an e-bike. There is a lot going on here to ensure that riders have a great experience with a bike they can trust. The electric bike has RockShox suspension system to provide plenty of comfort as riders tackle their chosen terrain. 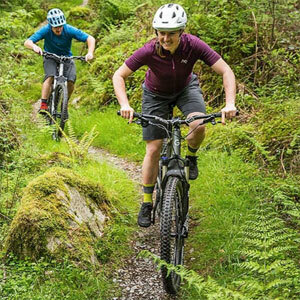 The addition of the gears and 27.5’’ off-road tyres also help users handle the ride at their own pace with no risk. There are also strong hydraulic disc brakes, just as users would expect with any top mountain bike. The difference with this model is the battery. This helps assistant riders on more difficult areas, or when they get tired, but doesn’t run the show. In fact, users have a nice amount of control over the settings. The 36V high torque motor has different settings: full power for tough climbs, eco to save a little battery life and an off switch to convert to an ordinary bike. There are a couple of little quirks to this Gtech Electric Mountain Bike that might annoy some users. For the most part, the user reviews for this ebike are pretty good. Most seem to be impressed with the build and performance. However, there are two small issues that new buyers need to take into consideration. The first is the assembly process. It is always a good idea to opt for a professional assembly with any bike. Here, that service might help users avoid some issues with the mudguards. Those guards are a nice touch when installed correctly, but fiddly to get into place with the wheels on. The second issues is the height of the bike. There are some shorter users that have struggled a little and feel that the bike is higher than average. They attribute this to the thick tyres and high sprung seat. What does this all mean when recommending this Gtech eScent to other riders. Those that are aware of the assembly issues and pick the right frame for their height should have few issues with this bike. The combination of the build, handling and the performance of the battery all combine for a great experience. There is a definite sense here that this is a mountain bike with an additional battery capability, rather than an electric bike with a beefed up spec. This should make a big difference to riders that want to take this Gtech electric bike on longer adventures. 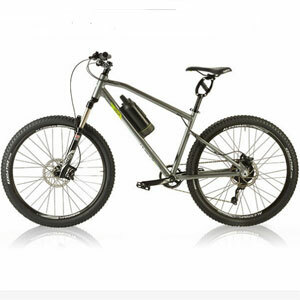 Find more reviews about the Gtech eScent Mountain eBike here.